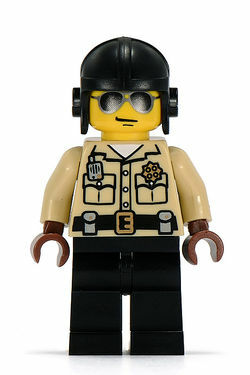 The Traffic Cop is a minifigure from 8684 Minifigures Series 2. He comes with a helmet with clips for a visor or goggles (not included), a speeding ticket, and a set of handcuffs. He wears large sunglasses (printed onto his headpiece), and has brown hands. The Traffic Cop on his base.